Commander Barry WIlmore works on Monday to install a 3D printer inside the Destiny laboratory’s Microgravity Science Glovebox. It may not be a "Star Trek" replicator, but the first zero-gravity 3D printer is set up and ready for action on the International Space Station. 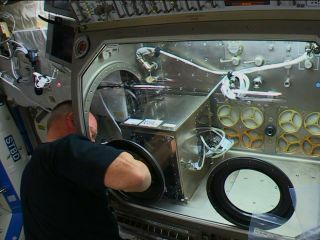 Station commander Barry "Butch" Wilmore of NASA installed the space 3D printer inside the orbiting lab's Microgravity Science Glovebox on Monday morning (Nov. 17). The machine and its software are in good operating condition, and the first test items will likely be printed sometime Monday, NASA officials said. "This is a very exciting day for me and the rest of the team," Mike Snyder, lead engineer for California-based startup Made in Space, said in a statement. "We had to conquer many technical challenges to get the 3D printer to this stage." Made in Space designed and built the 3D printer, which arrived at the space station in September aboard SpaceX's robotic Dragon cargo capsule. The machine's operations on the orbiting lab are part of the 3D Print project, a collaboration between Made in Space and NASA. NASA has high hopes for 3D printing, saying the technology could make space exploration cheaper, safer and more efficient. Voyaging spaceships with 3D printers onboard, for example, could manufacture required tools or spare parts rather than rely on resupply from the ground. The 3D Print project is a crucial step toward making that vision a reality, allowing engineers to verify that the technology works in microgravity the same way it works here on Earth, said NASA's Niki Werkheiser, 3D Print project manager. "NASA and Made in Space have flown parabolic flights and tested this, but you only get short spurts of microgravity," Werkheiser, who's based at Marshall Space Flight Center in Huntsville, Alabama, said on NASA TV Monday morning. "Space station is actually the only platform where we're able to test this technology before we use it on further-out exploration missions." The items printed aboard the space station will eventually be brought down to Earth for an "apples to apples" comparison with identical objects printed by the machine before its launch. The next step will be demonstrating the utilization of parts printed aboard the orbiting lab, Werkheiser said.